Hints of what’s to come in next spring’s Windows 10 Creators Update just keep on coming. Microsoft recently released Windows 10 Insider Preview build 14971, which integrates Paint 3D, turns your browser into an e-reader, shuffles Command Prompt into the shadows, and more. First up: Edge-as-e-reader. Starting with build 14971, Microsoft says Edge will be able to display any unprotected ebook in the epub format. That’s not a hugely exciting addition for PC users (though they can use it), but for anyone with a Windows 10 tablet it means one less app you have to download. Edge actually offers all the basic features you’d want in an ebook reader, including three themes (dark, light, and sepia), the ability to bookmark pages, a navigable table of contents, search, and a seek bar at the bottom of the browser. Since this is Edge, it also features Cortana integration, allowing you to summon the definition for specific words. In build 14971, Edge can open epub files. The impact on you at home: In my brief look at Edge, this is definitely a work in progress. I tried out the new feature in a virtual machine using an unprotected copy of Harry Potter and the Deathly Hallows. The rendering of the epub file wasn’t great until I rearranged the window size into something a little more “tablet-y.” Performance was also a little slow, but I’d chalk that up to the virtual machine. There’s no longer any need to download Paint 3D from the Windows Store. It’s now included with every Windows Insider build from 14971 and up. In fact, the old Paint appears to be completely gone—sometimes Microsoft will hide old system features. If you navigate to C:\Windows\System32\mspaint.exe and click it, Paint 3D shows up—not the classic Paint application. If you head to Start > Windows Accessories > Paint it also opens Paint 3D instead of the original. It’s all PowerShell in the power user Start context menu in build 14971. Tap Windows key + X or right-click the Start button in build 14971 you’ll see there’s no longer an option for the good old Command Prompt. Instead, it’s been replaced by options to open PowerShell. The Command Prompt isn’t gone by any means; it’s just being de-emphasized. You’ll also see PowerShell instead of the Command Prompt in File Explorer when you right-click on whitespace to call up the context menu. PowerShell is taking precedence over the Command Prompt just as the utility celebrates its 10-year anniversary this week. 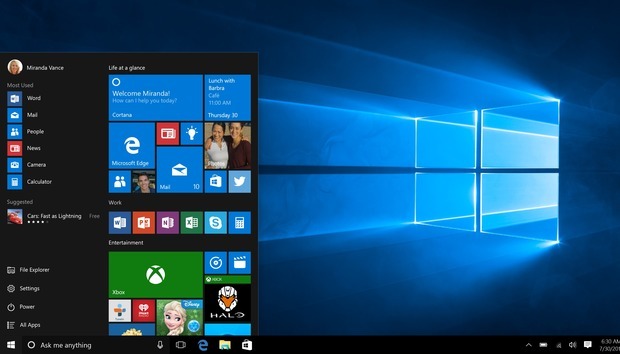 As with any Windows 10 Insider build there are also a number of smaller changes and improvements. The Outlook Mail Windows Store app now supports OAuth for Yahoo Mail. Microsoft made some changes to the Get Office (Beta) app to make it more of, well, an app. Instead of a bunch of links and videos, you can use it to access to your Office account, files saved in OneDrive, and other features for Office 365 subscribers. Microsoft also killed Edge’s snooze tab feature, which was introduced in preview build 14926. The trial feature let you set a Cortana reminder to look at a tab again after a set period of time. “Based on data we gathered and feedback we received, we decided to remove it from the product and re-evaluate the feature for a future release,” Microsoft said.